Please share this image wide and far. 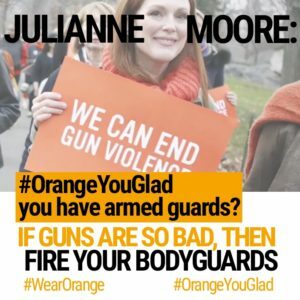 Julianne Moore needs to check her privilege. She’s yet another anti-gun celeb who enjoys the luxury of armed bodyguards, but thinks her underling citizens shouldn’t be afforded their 2nd Amendment rights. Moore, along with her predictable posse of high-class gun controllers, have recently “taken action” via their silly #WearOrange campaign. The Clockwork Orange gang’s campaign continues through the next 26 days; they’ve declared June to be National Gun Violence Awareness Month. Like clockwork, Moore & Co. are quick to push for more gun control and manipulate statistics, without providing any tangible specifics on how to prevent or control gun crime. 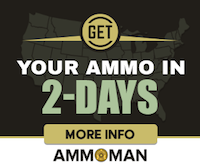 The actors, actresses, and other celebrities do not espouse any particular way to prevent or control gun crime, but many of them do share the exaggerated claim that “93 Americans are killed” by “gun violence” each day. Breitbart News has repeatedly pointed out that this figure actually swells the number of people killed via “gun violence” by 66 percent. In reality, the number of people killed via actual “gun violence” ranges from about 10,500 to 12,000 a year. Clinton swelled that number by adding in firearm-related suicides, which number roughly 20,000 to 22,000 per year. Everytown, Moore, and Schumer have done the same thing to swell their figures. h/t to Joe for nominating to meme Julianne Moore.